Sweet and spicy sauce (and a cook time of less than 30 minutes) puts these fish tacos at the top of Taste and See’s weeknight rotation. To make the cabbage slaw, combine cabbage, cilantro, green onions, garlic, ginger, fresh lime juice, honey, olive oil and salt in a large bowl. Toss and set aside. To make the sweet + spicy sauce, whisk together mayonnaise, sweet chili sauce, and Sriracha / hot sauce in a small bowl. Then set aside. 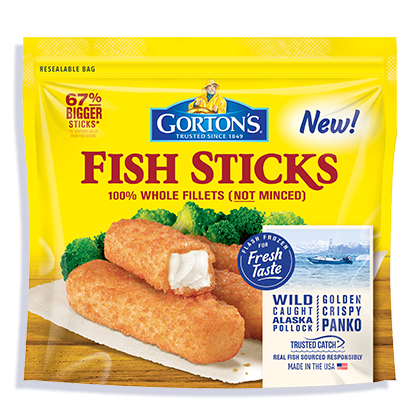 Bake 16 Gorton’s Fish Sticks for 12-14 minutes on a parchment-lined baking sheet. Flip once at 8 minutes. Meanwhile, heat a sauté pan over high heat. When the pan is hot, spray a little cooking spray on both sides of a corn tortilla and toast for 20-30 seconds per side. Repeat with 7 more tortillas. 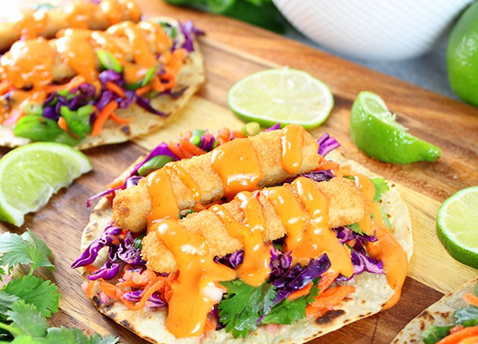 Assemble tacos with tortillas, slaw, and fish sticks. Drizzle with sweet + spicy sauce, then garnish with cilantro and lime juice.